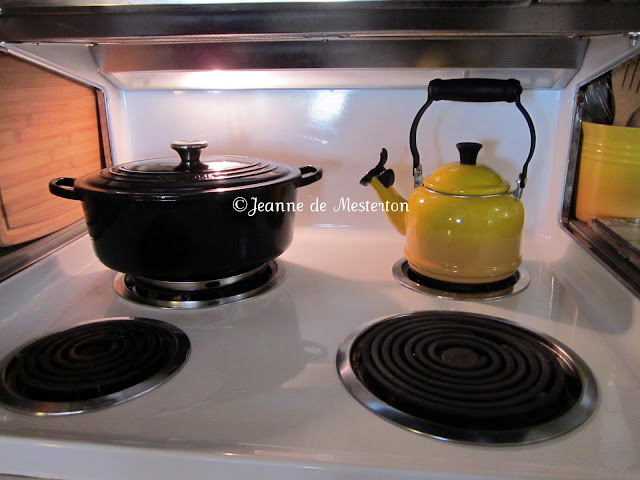 My black Dutch oven is sitting upon a simmer-mat that has been placed on the back burner. This inexpensive, invaluable tool protects the pot and its contents from scorching, while slow-cooking at low temperatures. Many cookers just cannot be set low enough to prevent burning foods or even destroying the vessels in which they are cooked. Simmer pads solve that problem in an easy and elegant manner. Berard makes beautiful, strong olive wood spoons in Provence. The classic metal toaster by Cuisinart comes with two slots or four, and both models are under $100.00. A perfect example of tasteful, old-fashioned beauty combined with a high-tech operating system, the Cuisinart toaster is the best I have ever used.